Richard THURLOW (1606 – 1685) was Alex’s 11th Great Grandfather, one of 4,096 in this generation of the Shaw line. Richard was born ca.1606 in Holme-Upon-Spaulding-Moor, East Riding Yorkshire, England. His parents were Francis THURLEY and [__?__]. He married Jane [__?__] before 1636. From all indications Richard Thurlow and his wife Jane sailed in 1638 from Hull, Yorkshire to Boston on the ship, “John of London.” He was one of a group consisting of about 60 families led by the Rev. Ezekiel ROGERS, most of whom had been residents of the Yorkshire village of Rowley and it’s surrounding area. He was a planter and settled first in Rowley Mass, owning land there in 1640. He removed to Newbury, Mass., 1651, Richard died 10 Nov 1685 in Newbury, Mass. Jane was born about 1610 in England. She died 19 Mar 1684 in Newbury, Mass. Unfortunately, there is little directly related historical information about the ship — “John of London“, let alone about the specific voyage in 1638 that carried this group to their new home in New England. Undoubtedly, Rev. Rogers kept records and a log during the voyage, but these, along with most of his belongings, were lost in the fire that destroyed his dwelling in Rowley, Mass. a few years after he and many of the group settled there. Until shortly before the group left Yorkshire, the Rev. Rogers was vicar of St. Peter’s church in Rowley for many years. Following the voyage to New England, he and many others in the group founded (in 1639) and settled in the village of Rowley, Mass., named after his previous English residence. In 1994 the people of Rowley, Mass. gave to the church of St. Peter’s in Rowley Yks. a stained glass window to honor the memory of their founder. This window depicts Rev. Rogers, several of the settlers and the ship upon which they sailed. George Lamberton took the settlers over to Boston where I believe he already had a house. There was some sort of dispute between him and the Rev. Ezekial Rogers. Lamberton, a seafarer trading down the eastern seaboard, wanted to join Davenport and go to New Haven (group of rich merchants, from London) He is listed on one of the best plots on the map of nine squares of New Haven. Just looking at the map, Rowley is slightly inland and would not have suited a sea captain. Edward Atwater in his History of the Colony of New Haven, mentions a minister of high standing in Yorkshire named Ezekiel Rogers who, having embarked at Hull on the Humber, with a company that personally knew him and desired to enjoy his ministry arrived in Boston late in the summer (in 1638). Rogers originally planned to join the colonists at Quinnipiac (New Haven) but something was not to his satisfaction (I don’t know what) and he remained in Massachusetts Bay Colony. He established himself and his group at a place in Massachusetts that he called Rowley. On the “tenth of the eleventh Anno Dni 1643, Thomas Nelson, Edward Carlton, Humphrey Reynon & Francis Parrot made a survey of the town and a register of the several house lots of from 1 1/2 to 6 acres then laid out to the settlers. 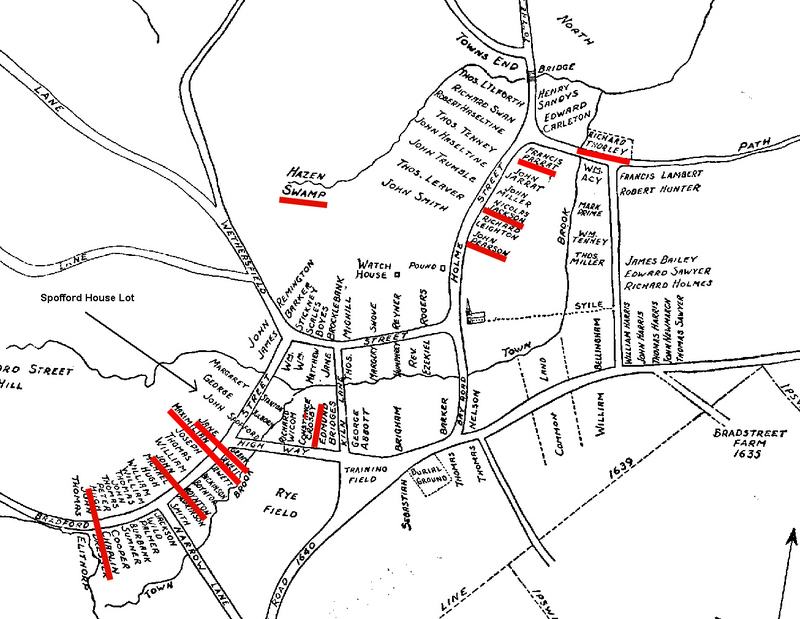 10 of our ancestor families (underlined in red) had plots in Rowley in this 1642 map. Richard THORLEY’s lot is in the northeast corner of this map. Here is today’s approximate location of Richard’s lot on Google Maps..
3 May 1654 – The General Court noted that Richard Thorley, having built a bridge over Newbury (Parker) River at his own expense was at liberty to collect toll for cattle, but passengers to go free. 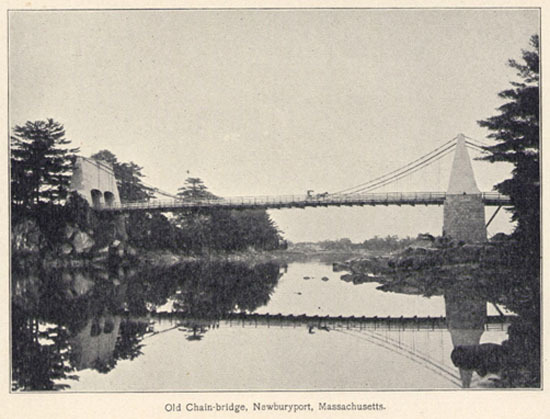 This was the first bridge erected over navigable waters within the limits of Old Newbury, and over navigable waters within the limits of Newbury, and comes third in the list of bridges that have been in continuous use in New England for two centuries and a half. It had been rebuilt and repaired several times but the location remained the same and it stands on the same site it occupied 350 yrs ago. 27 Jan 1669 – Richard gave part of his farm to his son Thomas wich was to pass to his son Franics in case of Thomas’ death. His wife Jane joined in the deed. 29 May 1671 – Richard was fined four nobles [a noble was six shillings and eight-pence so Richard fine was a little more than a pound] for his part in the Parker-Woodman War. For many years the church in Newbury had been divided, almost equally, between the original pastor, Reverend Thomas Parker, and Mr. Edward WOODMAN, of whom the noted historian Joshua Coffin wrote: “He was a man of influence, decision and energy, and opposed with great zeal the attempt made by the Rev. Thomas Parker to change the mode of Church government from Congregationalism to something like Presbytarianism.” This divison of the town was not due to a great difference of theology, but of church governemt. All others Nicholas Batt, Anthony MORSE Sr, Abraham Toppan, William Sawyer, Edward Woodman junior, William Pilsbury, Caleb Moody, John Poor Sr, John Poor Jr, John Webster, John Bartlet Sr., John Bartlet Jr, Joseph Plumer, Edward Richardson, Thomas Hale Jr., Edmund Moores, Benjamin LOWLE (LOWELL), Job Pilsbury, John Wells, William Ilsley, James Ordway, Francis THORLA (THORLAY), Abraham Merrill, John Bailey, Benjamin Rolf, Steven Swett, and Samuel Plumer, a noble each. However, the judgement of the court did not bring an end to the controversy, and the conflict continued for several years. Note: For a complete chronology, see pages 72-112 of Joshua Coffin’s History of Newbury. Mary’s husband John Woolcutt was born 1632 in Newbury, Essex, Mass. His parents were William Walcott and Alice Ingersoll. John died 30 Sep 1690 in Springfield, Hampden, Mass. William is thought to have left Salem about 1644, leaving his family behind. In that year a law was passed saying that all who opposed infant baptism were subject to banishment from the colony. In 1651 he or another William Walcott was a shoals witness in Maine. In 1652 the Salem records show that “means were taken by the court to preserve his estate.” This probably included selling his land, because in 1652, Robert Goodell of Salem owned land at Salem which included 30 acres that had formerly been granted to William Walcott. Lidea’s firsst husband Nathaniel Wells was born 1636 in Salisbury, Essex, Mass. His parents were Deacon Thomas Wells and Abigail Warner. Deacon Thomas was the son of our ancestor Thomas WELLS (Colchester) (1566 – 1620), Abigail Warner was the daughter of our ancestor William WARNER. Lidea’s second husband Nathaniel Emerson was born 18 Jul 1630 in Bishops Staffordshire, Hertfordshire, England. His parents were Thomas Emerson and Elizabeth Brewster. He first married 1653 in Ipswich, Essex, Mass. to Sarah [__?__] (b. 1634 in Ipswich, Mass – d. 3 Aug 1670 in Ipswich). Nathaniel died 29 Dec 1712 in Ipswich, Essex, Mass. Martha’s husband John Dresser was born 1640 in Rowley, Essex, Mass. His parents were John Dresser and Mary [_?__]. John died 14 Mar 1724 in Rowley, Essex, Mass. This entry was posted in 13th Generation, Historical Site, Immigrant - England, Line - Shaw, Pioneer and tagged Newbury, Rev. Ezekiel Rogers, The John of London 1638. Bookmark the permalink. Lidea Thurley above, died in 1669, but her m/2 to Nathaniel Emerson shows that they married 1694. Thank you so much for your research and all the effort that has gone into this work. 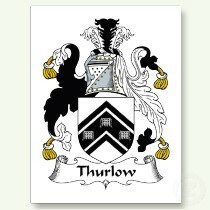 Really appreciate the Thurlow/Thorley, etc. ‘story’! Wonderful body of work! Thanks so much for the great detail! I am descended from Richard Thurlow through daughter Mary Thorley (9th ggrandmother). Coincidentally I grew up in the area of Newbury and have been curious about the exact location of the bridge over the Parker River. However the picture of Chain Bridge that you list here crosses the Merrimack River and connects Newburyport with Amesbury. I believe the bridge is closer to the area of The Governors Academy (formerly Governor Dummer Academy) closer to the Byfield section of Newbury.